MR Online | Elections in Brazil–guess who turns up? Elections in Brazil–guess who turns up? Posted Aug 29, 2018 by Eds. I’m reacting to a news report by teleSUR(1) and reprinted by MintPress News(2) saying that Steve Bannon will be advising far-right presidential candidate in Brazil, Jair Bolsonaro in the upcoming elections in October. What could someone with racist views contribute positively to a country like Brazil where 51% of the population is black or mixed? This is the same Steve Bannon who helped “Trump ascend to the U.S. presidency” and served in his administration for one year after being dumped. Bannon is also the former executive chairman of the far-right syndicated Breitbart News Network. Any association with Breitbart News, even if “former” association, does not reflect well on Mr Bannon. The network is widely considered to be ideologically driven, with a reputation for publishing misleading stories and “news” with racist and xenophobic overtones. 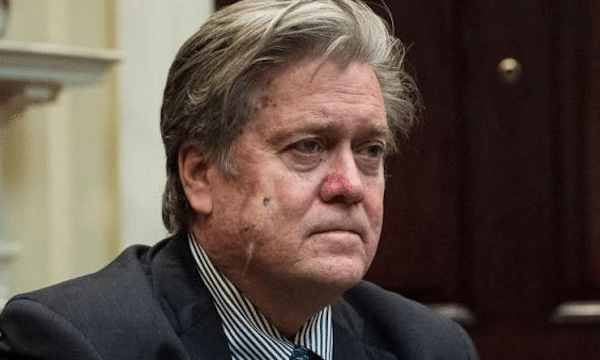 Having burned off his bridges in the U.S., Mr Bannon resurfaces to go international presumably with his quest for a worldview that we hoped was long gone. His view has a “white-economic-nationalist agenda.” The last time we confronted a similar agenda, it came from Nazi ideology with all the consequences we know. But we also know that in the 21st century there is a revival of white supremacist ideology popping up from the U.S. to Ukraine via Israel. As if it wasn’t enough that Brazil had a coup that installed unelected president Michel Temer to replace elected president Dilma Rousseff, we may live to see a surge of white supremacy in Brazil, of all places. In the history of Latin America, this would be going 500 years back in time during European colonial rule. According to the Telesur report, Bannon is an admirer of Brazil’s presidential candidate Jair Bolsonaro. That explains the reason to be his political advisor. Also according to Telesur, “Bannon said that Bolsonaro’s mission in Brazil” will be more “arduous” than Trump’s presidential campaign. That, in turn, might explain his personal interest in choosing the challenge. Bolsonaro is running for the Partido Social Liberal (Social Liberal Party – PSL). Despite the name, this is a very rightwing party. He is running on a platform of privatization of public enterprises, reducing government and privatizing basic and higher education. There is a general consensus that the statistical advantage of Bolsonaro in the polls is because the leading popular candidate, Luiz Inacio Lula da Silva of the Workers’ Party (PT), is still in prison since last April with trumped-up charges. A large proportion of Brazilians want Lula to be freed, which will surely see him as the winning presidential candidate for the Workers’ Party (PT). Obviously, Bolsonaro strongly opposes Lula’s freedom and candidacy, and he has mockingly stated that he favours a free Lula but “in 2030”.